I need a very high resolution printer say, 1500dpi x 2400dpi or better, either laser or inkjet. This is for my microfabrication design work. What can you suggest? Are there any ink cartridges of very high quality similar to the quality of laser toners? Unfortunately, we do not work with the printers themselves so are not best placed to offer such advice. However, many of the wide-format Epson inkjet printers will give you a high resolution. For instance, the Epson Stylus Pro 11880 has a maximum resolution of 2880 x 1440dpi. Xerox also manufacture laser printers which can produce high resolution graphics. We would of course be more than happy to help you asses costs of consumables once you have found a few printers that are of interest to you. I'm sorry we couldn't be of more help. This simple laser printer has a small footprint and weighs only 15.4 lbs. The Apple Laserwriter 320 measures 6.3 x 15.2 x 14.9 inches. It doesnt offer an on/off switch, and print speed is only 4 ppm. The ROM size is 4 MB while the RAM size is 2 MB (expandable to 6 MB). 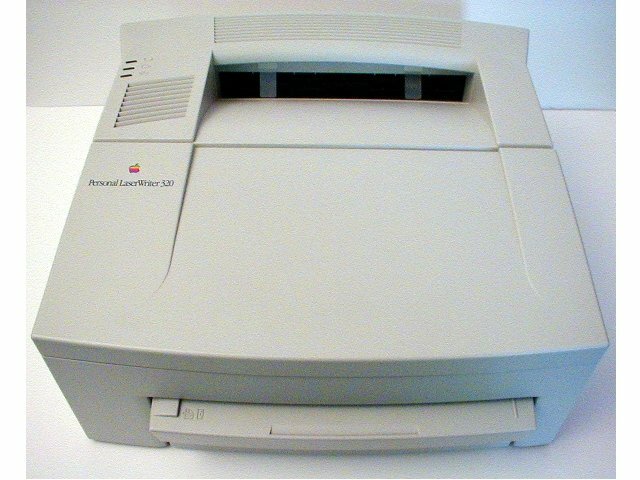 The Apple Personal Laserwriter 320 laser printer has a paper feed and tray at the bottom and an output tray on top. The official Apple Personal Laserwriter 320 cartridges are now discontinued meaning this device now runs on cartridges designed and made by Hewlett Packard. This printer can only be used with Apple computers as it only supports LocalTalk connectivity. Print speed is slow. Also, the Apple 320 Personal Laserwriters paper handling capacity is very low.